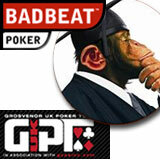 Badbeat.com has sent a team of poker mentors and player support staff to the GUKPT poker tournament in Coventry this week to check out the talent and to put the word out about the new MyGame online training system they’ve just launched. Badbeat.com has been sponsoring and mentoring promising players since 2005, and now the revolutionary new MyGame training system modeled on that experience is free to anyone that’s ready to step up their game. “Big tournaments like this are a good chance for us to see who’s out there, who could really benefit either from the kind of full on mentorship we give our sponsored players or from the free training system we’ve just put online,” said Jeff Burke, Badbeat.com’s Head of International Mentoring. Burke is joined in Coventry this week by several players sponsored by Badbeat.com as well as Phil Wise, Poker Analyst; Sam Brown, Cash Mentor; Darren Hedley, Tournament Mentor and three members of the Poker Player Support team. The GUKPT Goliath, held at the Ricoh Arena in Coventry 24th – 28th August, is a unique opportunity to attempt the ultimate live poker challenge -- taking on the largest ever tournament field in Europe for the richest prize pool ever seen at this buy-in level. Starting Wednesday at the home of Coventry City Football Club, the Goliath has a £100,000 Guaranteed Prize Pool and aims to break the European record tournament field with over 1600 runners. 25% of entrants’ registration fees will go to Marie Curie Cancer Care, a charity partner of both the Coventry City Football Club and Grosvenor Casinos. The MyGame system is designed for any player that wants to learn, win and transform the way they play poker - all for free. It builds players’ poker skills from the ground up by analysing actual play. Access to Badbeat’s tutorials, the unique hands analysis tool, Report Cards, and Social gaming features are all free after registering with any of Badbeat’s partner poker sites.